Having a standard order of worship or liturgy in the MCS would provide a clear guide for its clergy and members on how to conduct worship services, baptise, administer holy communion, dedicate houses, marry people, conduct funerals, ordain persons, consecrate and dedicate buildings and so on, as well as the Scriptural basis and reasons for ordering worship in this manner. LAY LEADERS from the three Annual Conferences concurred on the need for a standardised order of worship across churches during their discussions at the biannual Bishop’s Lunch Fellowship at Sophia Blackmore Hall, Methodist Centre, on Feb 25. Spontaneous agreement brought the issue of worship practices, particularly in the administration of the Sacraments of Baptism and Holy Communion, to the fore as the lay leaders discovered that their practices diﬀered across and even within the Annual Conferences. Mr V. Johnson, Local Church Executive Committee (LCEC) Chairman of Seletar Tamil Methodist Church, felt that diﬀering practices in administrating the sacraments may result in some of the meaning being lost, for example, whether communion should be served to worshippers in the pews or if they should be given the opportunity to respond to the invitation. “Going forward is more significant,” he said. Mr Anton Moses, LCEC Chairman of Ang Mo Kio Tamil Methodist Church, shared that his 14-year-old son had questioned the diﬀerences in the administration of communion between their congregation and the two other Methodist congregations that share a joint worship venue. Mr Han Hai Kwang, Lay Leader of the Chinese Annual Conference, urged on behalf of his discussion group that “as the sacraments are so important to the life of the church, they should be used as a unifying factor”. 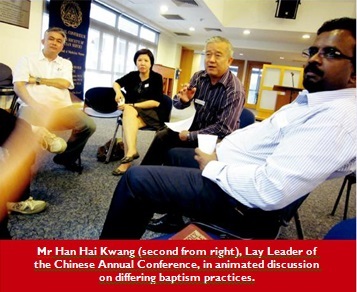 Mr Lim Tanguy, Lay Leader of Kampong Kapor Methodist Church, added: “ e importance of the sacraments should give rise to a consistent position and standard practice of these across all Annual Conferences”. 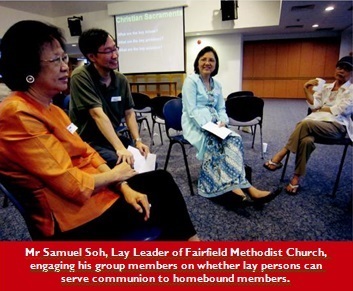 Mr Samuel Soh, Lay Leader of Fairfield Methodist Church, asked for clarification on whether liturgy was in the domain of the clergy, and whether it was appropriate for lay leaders to raise the issue of a standardised order of worship. Bishop Dr Robert Solomon responded that liturgy was in the domain of both clergy and lay, and it was appropriate to raise it for discussion at a General Conference or Annual Conference. “ is is not just a theological discussion but a necessary practical discussion,” he said. He also noted that the Book of Discipline originally contained a section on the oﬃcial liturgy of the church, but was removed for practical reasons. 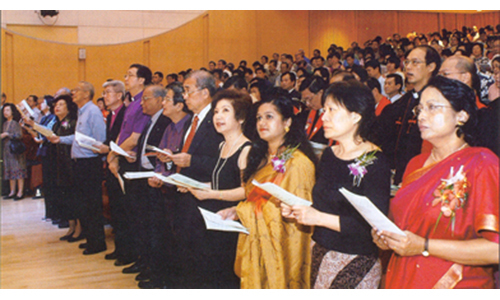 In other Methodist conferences such as the United Methodist Church, the section was reintroduced on its own as e United Methodist Book of Worship along with the e United Methodist Hymnal, but e Methodist Church in Singapore (MCS) has not oﬃcially sanctioned any liturgy or developed its own liturgical resources relevant to the local context. 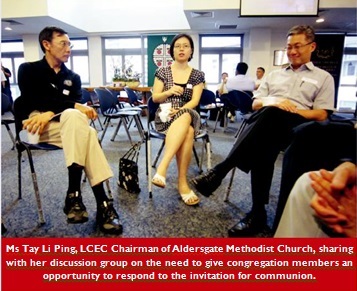 Ms Tay Li Ping, LCEC Chairman of Aldersgate Methodist Church, welcomed the idea of having a standard book of liturgy across local churches rather than allowing it to be decided by the Pastor-in-Charge or the local church. “ is would be helpful so that there are fewer changes if there is a new Pastor-in-Charge,” she said. Lay leaders will have the opportunity to raise such convictions and concerns to the General Conference through the use of petitions submitted for the coming 10th Session of the General Conference, which will be held from Sept 3 to 8 and Dec 6 to 7 this year. e General Conference, comprising ministerial delegates and lay delegates in equal numbers, will consider such petitions during the session, among fulfilling other important functions such as the election of a new bishop. 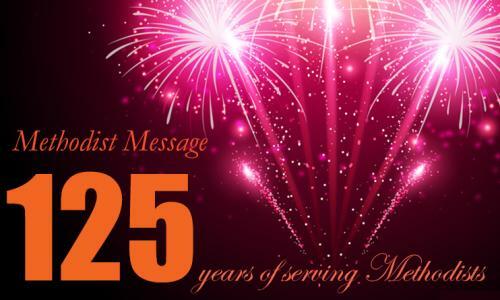 The Bishop had earlier spoken about sacraments in the Methodist Church, highlighting Scripture passages such as Matthew 28:18-20 and Luke 22:19 to emphasise Jesus’ commands to administer baptism and communion respectively. He also quoted from the Book of Discipline, the writings of John Wesley and those of other churchmen such as Richard Watson and Adam Clarke to support the position of the sacraments as means of grace to help Christians grow in faith, to be regarded with reverence but not in a superstitious or “hyper-sacramental” view. The Bishop pointed out that these resources on the sacraments were easily available on the Internet and encouraged lay leaders to read and share these free resources with other lay leaders or members in their congregations. He also took the opportunity to clarify some frequently-encountered queries about the sacraments; for example, that only ordained elders or in their absence, deacons with letters of dispensation, can preside over communion services. 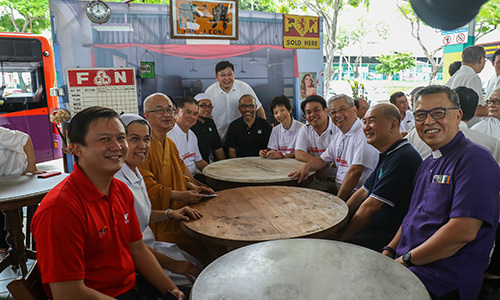 Mr Soh enquired whether lay people are allowed to serve communion while visiting homebound members, after the elements have been consecrated by the clergy. e Bishop said that “while the homebound are not to be excluded from the holy communion, the ordained pastor should administer it (as far as possible) as well as pray over the homebound member, which is his pastoral duty”. If not, an authorised person may bring the elements (duly consecrated by the minister) to the person. Can communion be served at a wedding service? is is permissible only if the liturgy is followed, and participation is open to the whole congregation, as communion is a church-wide practice and not a private ceremony to be watched. The communion liturgy as laid out in e United Methodist Hymnal (UMH) must be followed, as it contains essential ingredients without which the meaning of the Table would be minimised, ignored or distorted. In response to a question about leading children through the communion liturgy apart from the main congregation, Bishop Dr Solomon warned of the danger of disassociating children and youth from the rest of the church, which may lead to higher drop-out rates as they grow apart from the adult congregations. 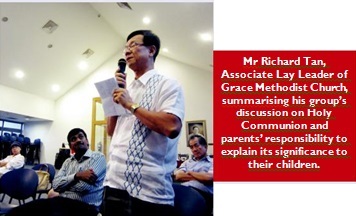 Mr Richard Tan, Associate Lay Leader of Grace Methodist Church, raised the question: “Are parents told of their responsibility to ensure that their children know the significance of taking holy communion?” e Bishop’s response was that there should be classes for parents before their children are baptised, to help the parents understand what is being done and what is required of them in teaching their children about the sacraments. Appropriately, the session closed with the singing of Charles Wesley’s hymn on the Sacrament of Holy Communion, “Come, Sinners, to the Gospel Feast” (UMH 616).